Calvin will host a lecture remembering the 1937 Haitian Parsley massacre, in which Dominican dictator Rafael Leonidas Trujillo Molina ordered the murder of thousands of Haitians. This lecture is part of the history department colloquium series but is also one of two lectures sponsored by African and African diaspora studies (AADS). 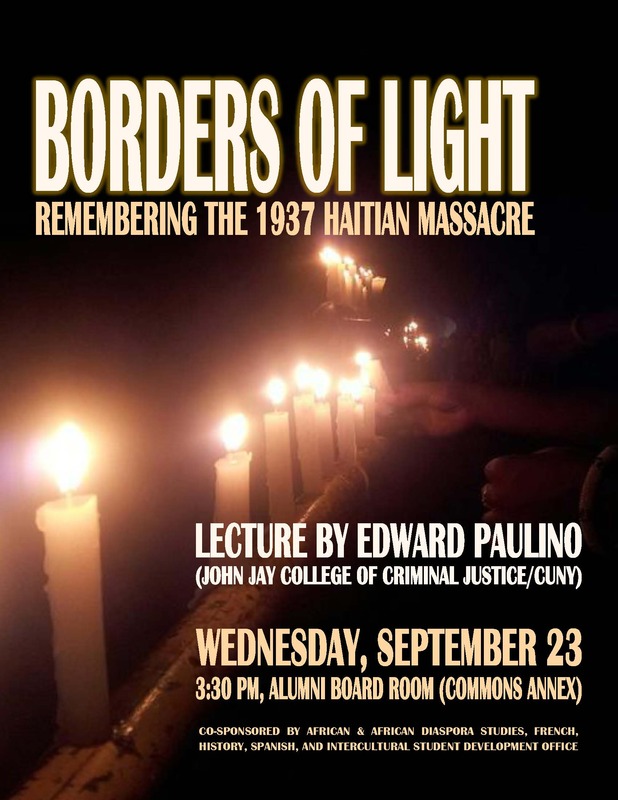 Leading the event will be Edward Paulino, a historian at the John Jay College of Criminal Justice, who has done extensive graduate work on the massacre. “A Christian liberal arts institution such as we are should be conversant about atrocities that occur globally, both historically and at present,” said Eric Washington, assistant history professor and the director of AADS at Calvin. Read the rest of the article to find out more about the massacre and the Border of Lights effort to commemorate it. All are warmly invited to attend this afternoon’s event. Visit our colloquia and events page to find out more about this lecture and other public events. This entry was posted in Historical Horizons and tagged Border of Lights, department events, Dominican Republic, Haiti, Haitian Massacre, history, Parsley Massacre. Bookmark the permalink.